This information is important to you, because at some time in our lives, we are transformed by humility. If the knowledge of the importance of bacteria does not humble you, maybe nothing else will. Alcohol and energy are universal compounds in our global economy. Everyone is familiar with alcohol fermented from starches and bacteria. This alcohol is important for our social activities. Bacteria are used in our food industry to facilitate the creation of products like cheese, yogurt, pickles, sauerkraut, sausage, sourdough, etc. Likewise in the pharmaceutical industry, bacteria are the pivotal agents for Vitamin B 12, antibiotics, alcohol, and newer medications using genetic replication in bio-technology. 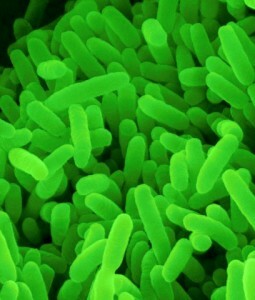 Likewise, bacteria regulate and protect our immune system from invaders and are vital in keeping us healthy and alive. Inside our body where there is no Oxygen, bacteria live and function anaerobically. They are a part of our body equaling an amazing 1-3% of our body weight. There are an unimaginable ten times ten trillion bacteria of innumerable species in our body. Each person has specific amounts of normal species. This will destroy any new or mutated bacteria that are introduced into the body. Some people carry bacteria, which do not harm them, but harm others. Starting with our eyes, tears will destroy bacteria necessary. Newborns can get bacteria from the birth canal, which is treated with silver nitrate. The nose is filled with Staphylococcus. If you pick your nose and put on a wound, an infection will result. The teeth have their own defensive bacteria. However bacteria from food that is not brushed or flossed away will become sticky and harden to form plaque which in turn can cause cavities. The gut has ten trillion bacteria, which can change (digest) amino acids and carbohydrates to form hydrogen, carbon dioxide and ammonia without Oxygen. Vitamin B12 and the coenzyme Biotin are formed to regulate fatty acids. Also Vitamin K is formed, which regulates our clotting time when bleeding occurs. In Summary, any bacterial imbalance can lead to diseases including Cancer. A very precise and impressive topic with excellent representation and understandable vocabulary. I shall be looking forward for new pages.